Thursday, Feb. 19, marks the beginning of the new year according to the lunar calendar. In celebration of the Chinese New Year, or Lunar New Year, institutions in and around the city are hosting parades, dinners and parties. 2015 will be the Year of the Goat, taking over for 2014's Year of the Horse. Happy new year! To usher in the new year as it rings out, the Philadelphia Suns dancers will parade through Chinatown and bestow luck on it with the traditional lion dance, complete with firecrackers and big crowds. Kids will love learning to write Chinese characters, meeting Billy the Goat, hearing Chinese stories and watching ribbon dancers. Plus, Mel Hsu & The Philly Superhero Collective will play traditional Chinese kids songs with a fun twist. This International House tradition includes music, dancing and traditional Chinese cuisine for a night of community-wide celebration. 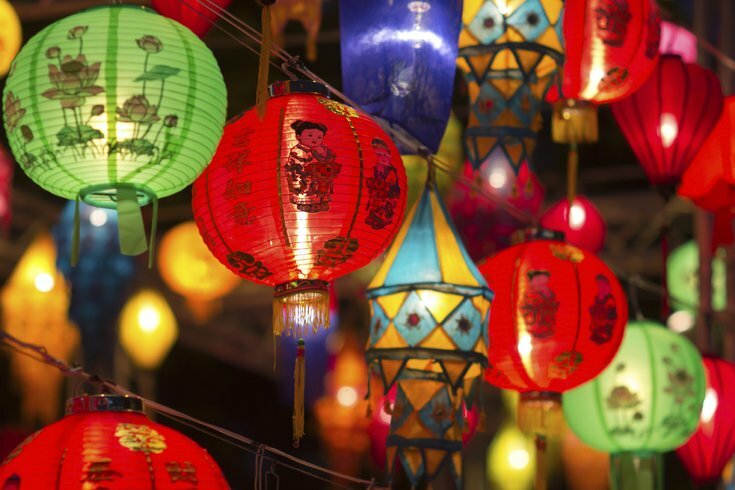 Pay tribute to the goat and discover East Asia-Pacific cultures through craft-making, martial arts demonstrations, dancing from the Penn Chinese Dance Club and Chinese storytelling. Also, sample dumplings prepared by the student chefs of the JNA Institute of Culinary Arts. 211 S. Columbus Blvd & Walnut St.
A big parade will celebrate the new year during the day - perfect for little ones who couldn't see the midnight performance! The Philadelphia Suns will dance and there will be martial arts performances and much more. Stephen Starr's Buddakan will host a special brunch service for the Chinese New Year that includes traditional dim sum, edamame dumplings, lion dancers and traditional red envelopes for good luck. The restaurant will also serve holiday specials Thursday, Feb. 19, through Friday, Feb. 27. A show of traditional Chinese music, dance, poems and martial arts will be followed up by a culture fair featuring craft stations for paper cutting, calligraphy and more. Chinese food and snacks will be available, too. Revel in a traditional banquet featuring 10 courses of delicious food accompanied by cultural performances. Celebrate Chinese New Year and Welcome the Year of the Sheep! Students from Holy Redeemer Elementary School will perform the traditional lion dance with drummers to encourage good luck for the new year, and Jennifer Chang, director of Northeast Regional Library, will tell Chinese folktales. Join the Philadelphia Chinatown Development Corp. for its annual fundraising banquet, which includes cocktails and dinner. The banquet supports the PCDC mission in projects like creating affordable housing. Media will celebrate with a parade that takes over all of State Street, beginning and ending at Margaret Kuo's and featuring the lion dancers of the Hung Gar Kung Fu Academy.